What is going on in the world of philanthropy? Billionaies, private foundations, corporations, public non-profits are all part of this ecosystem so where is their money going? 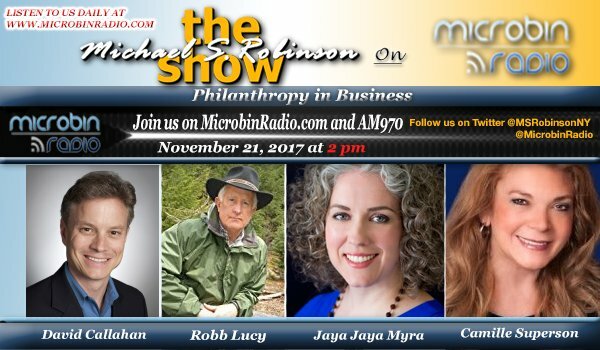 Michael talks with David Callahan on the power shift in philanthropy. For some, Thanksgiving dinner with the family can be stressful with clashing of different personalities and perspectives. Robb Lucy talks wuth Michael and shares tips on how to navigate the dibber and also how to take stock in creating your own legacy. Being well encompasses a whole range of issues from minding your diet to taking care of your psychological and emotional growth. Michael talks with Jaya Jaya Myra about how we can better take care of ourselves. A National Alliance for Caregiving 2015 study shows that up to 25% of caregivers are millennials, spending up to 34 hours in this role. The time, financial and emotional investment can be more than expected. Michael talks with Dr. Camille Superson as she shares advice on being a caregiver.